This work is licensed under a Creative Commons Attribution License. This copyright applies to the Gi2MO Types Taxonomy Specification and accompanying documentation in RDF. This taxonomy uses W3C's RDF technology, an open Web standard that can be freely used by anyone. Gi2MO Types is a taxonomy designed to be used for annotation of ideas in Idea Management Systems. The following document contains the description of taxonomy and instructions how to connect it with other metadata of Idea Management Systems and their other resources. What is Gi2MO Types for? The following specification is a formal description of taxonomy proposal that can be applied to annotate ideas stored in Idea Management Systems. The goal of the following section is to provide the basic knowledge to comprehend the technical part of the specification. As such it shall introduce the topic of Idea Management Systems and areas related to the Gi2MO project - Semantic Web and publication of open data on the web. An important note is that Gi2MO Types taxonomy presented here is not a complete model to address the problem of describing and linking ideas inside and between distributed Idea Management Systems. It marly defines concepts that are not described yet by the means of other taxonomies or standards and provides the data attributes that create the basis for establishing clustering and classification facilities for Idea Management Systems. For detailed instructions and recommendations how to use the taxonomy to achieve the aforementioned goals please refer to the guidelines of the Gi2MO project. Idea Management Systems, in a great simplification, can be considered as an evolution of suggestions boxes used for collecting input from customers. The said systems have went above and beyond mere collection of ideas and aspire to be tools for idea assessment, analysis and sometimes even deployment of innovation. Idea Management Systems take advantage of computer networks and web technologies to reach a large number of customers or enterprise employees at the same time, gather their ideas and invite to collaboration for improving those ideas. The use of IT infrastructure enables to collect big amounts of ideas in a fairly small amount of time but also brings the problem how to respond to the ideas from the community in a timely manner and how to continuously stimulate this crowd to keep supplying new ideas. Furthermore, in systems running over large periods of time the amount of ideas counted in tens of thousands becomes almost impossible to browse and manage either by moderators or users. All the said problems lower the efficiency of the systems or even put their usage into question. Gi2MO Types taxonomy is one of the building blocks for improving data organisation in Idea Management Systems and thus finding a solution to the aforementioned problems. In relation to other IT systems used in modern organisations, at the time of writing this specification the Idea Management Systems have not been yet introduced as a standard component as part of the most popular ERP, PLM/PLCM or CRM suites. Idea Management, in relation to those systems, is still being considered as a rising market and a complementary solution that can be supplied depending on organisation's interest in investment in innovation. In relation to other processes run in the modern enterprises, Idea Management can be defined as part of Innovation Management Process run as part of innovation strategy in many contemporary enterprises. Idea Management is perceived as complementary solution to this process that delivers tools that can enhance the successfulness of the innovation management process and open it to new possibilities. One of the corner stones of the Semantic Web is research on inter-linkable and interoperable data schemas for information published online. Those schemas are often referred to as ontologies or vocabularies. In order to facilitate the concept of ontologies that lead to a truly interoperable Web of Data, W3C has proposed a series of technologies such as RDF and OWL. Gi2MO Types uses those technologies and the research that comes within to publish the characteristics of ideas together with other metadata and enable the easy portability and integration of this information across different Idea Management Systems. 1.3 What is Gi2MO Types for? For more information please refer to Gi2MO Types usage study done as part of the research in the Gi2MO project. Every idea that was proposed has been triggered by a particular experience and describes a certain innovation put in context of application in a given object. 5 Complementary If the object that triggered innovation was a complementary solution that works together with the object to fulfil some OTHER function/goal. (removing one of the objects makes it impossible to fulfil this function). Idea: I use a scanner a lot so I would like it to be embedded in the laptop. 5 Supplementary If the object that triggered innovation was a solution that works on top of the existing and delivers some new value but does redefine the end functionality. Idea: Working with a mouse made me furious when I could not put the pad next to laptop because of the bad USB ports positioning. 3 Proceeds After the described innovation is implemented it is going to be possible to unlock other idea. ideaA: Keyboard for iPhone. ideaB: Backlit keyboard for iPhone. 3 Follows The innovation realization is dependent on implementing some other idea first. ideaA: Keyboard for iPhone. ideaB: Backlit keyboard for iPhone. 4 Subtractive Improvement made by simplifying other proposal and removing an element from the previous proposal. ideaA - serve breakfast with bread, tea, cornflakes, ideaB - serve breakfast only with cornflakes. 4 Replacement Improvement made just be replacing some element of the previous proposal. ideaA - colorA, ideaB - colorB OR putting glossy screen to laptop offerring (incremental modification because there are already glossy screens just not for this particular line). 6 Product Line Innovation describe with respect to a product line. E.g. Vostro Laptops or iPods. 6 Product Type Innovation described with respect to a particular product type. E.g. Laptops. 3 New The innovation proposes a new product. New laptop. 3 Existing The innovation proposes innovating an existing product. New laptop screen. 4 Additive The innovation proposes adding some new element to the object. Add delete key on the laptop keyboard. 4 Subtractive The innovation proposes removing some element from the object. Remove dvd drive from a laptop. 4 Replacement The innovation proposes replacing or modifying an existing element of the object. Replace the current screen with a better quality one. activities that the tablet is advertised for making the experience bad. example web browsing or games). An alphabetical index of Gi2MO Types terms are given below. All the terms are hyperlinked to their detailed description for quick reference. Below see a comprehensive list of all Gi2MO Types terms and their descriptions. AdditiveChange - The innovation proposes adding some new element to the object. 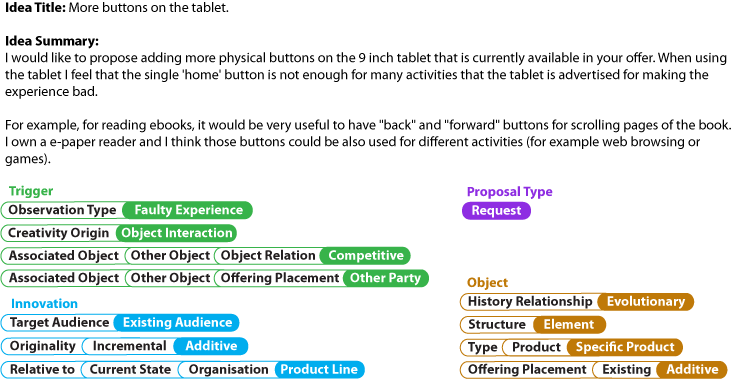 AdditiveInnovation - Improvement made by adding a new element to a previous proposal. Branch - Innovation relative to branch level of the organization (e.g. to use when the organization has already introduced the innovation in a certain branch but in antoher branch its completly unknown). CharacteristicChange - Innovation relates to particular feature of an object. ComplementaryObject - If the object that triggered innovation was a complementary solution that works together with the object to fulfil some OTHER function/goal. Removing one of the objects will make it impossible to fulfil this new function. ComplementaryWith - Object is complementary with some other object. CompleteChange - Innovation related to the entire product. ComposedOf - Is built of some other objects. CreativityOrigin - Points to what kind of event triggered the innovation. CurrentState - Innovation described in relation to the current state of some entity or environment. Department - Innovation described with respect to department level of the company. Dependence - Innovation is dependent in some way on some other idea. Duplicates - Innovation that exactly reproduces already existing idea. ElementChange - Innovation relates to an element of a product (a subelement or a characteristic of an element). Ecapsulates - Innovation that reproduces other idea(s) but also adds new value. Event - The innovation was not triggered by direct innovation with some object but by some event. Evolutionary - Indicates that the innovation for the given product puts it in a state that it has never been before. Excludes - Introducing this innovation causes the inability to implement some other innovation. ExistingAudience - Adaptive Innovation. Updates of an existing object to fit the changing needs of current customers. ExistingObject - The innovation proposes innovating an existing product. FaultyExperience - A problem/ failure of a product that caused a the creative process. Follows - The innovation realization is dependent on implementing some other idea first. Global - Innovation described with respect to the global market. Group - Innovation described with respect to group level of the company. HistoryRelationship - Relationship of the innovation with the previous iterations of the objects (or previous innovation proposals for this object). The difference with "Offering placement" is that it looks to compare the change with the past states of the object, not the current). IdeaContest - Idea was specifically triggered by idea contests and incentives that come with. Incremental - Improvement for an existing object. Innovation - Characteristics of the proposal and its impact. InnovationProposal - Innovation described in relation to other proposals in the idea management system. IsPartOf - Innovation that has been also described in another idea that also shows a bigger scope and discusses other items. IssueReport - Some idea are not innovative at all but nevertheless they are submitted to the idea management systems. This caregory indicates idea is not innovative at all just reports on a bug/issue/error/failure of an object. LackOfFeature - The innovation was triggered by the fact that object lacked some kind of feature. Local - Innovation described with respect to the local market. New - Completely new idea/design not based on anything created before. NewAudience - Shifted Innovation. It relates to shifting the object to fit new market/customer. NewObject - The innovation proposes a new product. NewObjectRelease - Premiere of a fully new object. ObjectComparison - Idea was triggered by comparison of the object of innovation with the some other product/object. ObjectInteraction - A person interacting with the object and discovering some new need or problem. ObjectObservation - The idea was initiated by observing an object (e.g. due to the desired to purchase it or general interest in the object). ObjectOfInnovation - Innovation was triggered by interaction with the same object that is the topic of idea. ObjectPurchase - Purchase of the object by the client. ObjectRelation - Defines the relation of the object that triggered the idea and the object that is the topic of the idea. ObjectRelease - Premiere of an object to the market or audience. ObjectUpdateRelease - Premiere of a new refreshed version of an already existing object. ObservationType - Type of Trigger. Defines what was the observation of the inventor due to the event that he experienced. OfferingPlacement - Determines if the other object that is the means of comparison is part of own offering or some other party. ProductLine - Innovation originality is described with relation to a particular product line (e.g. to be used when innovation is based on what has been already achieved in some other product line). ProductType - Innovation originality described in relation to product type (e.g. to be used when certain products in the organisation already have the innovation but a similar innovation is proposed for a totally new product type). Originality - Defines the size/scope of innovation in relation to existing ideas, state or offering. OtherEvent - Undefined event related in some way to the object. OtherObject - The inventor has came up with an idea by comparison of the object with some other product/service/process. OtherPartyOffering - Object that triggered the innovative ideas come from offering of some other party. OwnOffering - Object that triggered the innovative ideas come from own offering. OwnOfferingPlacement - Object placement in the current offering / state. PartOf - Object is part of some other object. PotentialCause - If a cause of the problem was identified. PotentialOportunity - The observation was not due to an negative experience but assumption that the object could be better if extended in some way. Proceeds - After the described innovation is implemented it is going to be possible to unlock other idea. Process - Innovation relates to a process. Eg. new elements into an organization’s operations such as input materials, task specifications, work and information flow mechanisms, and equipment used to produce a product or render a service. Product - Innovation relates to a product. ProductLine - Indicates more specifically that the object of innovation is the entire product line. ProductType - Innovation is targeted for a specific product type. PromotionalEvent - Event related to the object of innovation. ProposalType - Describes the way a person has formalized his ideas (what parts are there, what are missing etc.) What the the completeness of the proposal. Regressive - Indicates that the innovation for the given product was already implemented at some point but has been removed. Relationships - Defines if an object has relationship with other items of offering (reason: adding an innovation into a certain object might impact its relationships with other products and increase/decrease the value of innovation). ReplacementOfElement - The innovation proposes replacing or modifying an existing element of the object. ReplacementOfInnovationElement - Improvement made just be replacing some element of the previous proposal. Request - A person has supplied a request for a certain feature. Service - Innovation relates to a service. Opposing products, services are: intangible (cannot be physically possessed), inseparable (production cannot be separated from consumption), perishable (cannot store for future use), variable (the quality and consistency differs depending on the person that uses it). Solution - The person has supplemented the request with a technical or theoretical solution proposal. SpecificProduct - Innovation targeted for a particular product in the offering. Structure - Defines the element in the object structure that the innovation refers to. This should be connected with a domain ontology that identifies specific elements of products etc. StructureUnit - Innovation relative to a certain organization structure element (e.g. when innovation has been already introduced on some level of the organization administrative unit but not in another where it could be a brand new idea). SubtractiveChange - The innovation proposes removing some element from the object. SubtractiveInnovation - Improvement made by simplifying other proposal and removing an element from the previous proposal. Suggestion - Contrary to request does not state the necessity or need observed by the innovator but rather says what would be good in the opinion of a person for the particular company or organization. SuplementaryObject - Innovation triggered by an object that can be used on top of the existing item and delivers some new value by improving the characteristics of the item however does not redefine the end functionality (removing this object will still make it possible to perform the activity). TargetAudience - Defines if the innovation imposes a change in the audience or not (relative to current state of the object of innovation). Type - Type of object (is it product, service etc.). UnrelatedObject - The innovation was triggered by neither complementary or competitive solution. Replaced "ModificationOfInnovtion" and "Modification" with "ReplacementOfInnovationElement" and "ReplacementOfElement"
Under "Originality/RelatedTo" adde references to "OrganisationsProductLine", "OrganisationsProductType", also put organisation administrative units under "StructureUnut" and added "Branch"
Uner "Object/Type/Product" added "ProductLine", "ProductType" and "SpecificProduct"
Under "Innovation/Dependence" added "Excludes" and "isPartOf"
Special thanks for support with ontology creation and research to: Prof. Carlos A. Iglesias and members of the GSI Group of DIT department of Universidad Politécnica de Madrid and Dr. Theodore Dalamagas, Nikos Bikakis and Giorgos Giannopoulos from IMIS institute.